TAIPEI, SEPTEMBER 13 - In an interview with Business Weekly, Taisys Group Chairman Jason Ho discussed the company’s accomplishments in pioneering the eSIM ecosystem development, and Taisys’ Mobile ID delivering the high-security standard and convenience to securing one’s digital identity. Jason Ho, Chairman of Taisys carefully explains the IC chip is eSIM that is device agnostic, transforming any smartphone to support eSIM over-the-air download of mobile operator services. When traveling, the user can also switch between local telecommunications services freely at any time and as needed without having to extract the original SIM inserted in the phone and thus enjoy the convenience of the one-card multi-number services. If so, will this pose as a threat to the telecom operators who view locking the user’s SIM to their network as their main principle? 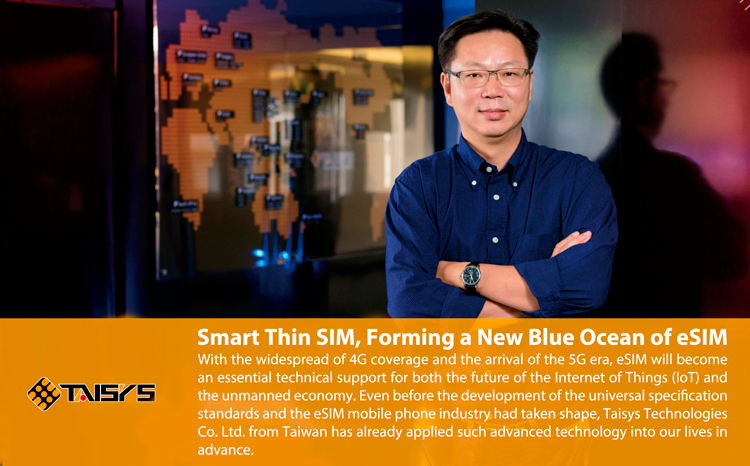 "eSIM has become the trend of the future. With the help of 5G popularization, it can provide consumers with more sophisticated and differentiated services, break through the current pricing deadlock of telecom operators, and generate more business models. We deliver eSIM as a service to end users on a form factor that creates flexibility and more value to mobile operators and white label partners”, says Ho. Taisys has built up relationships with MNOs and MVNOs globally to enable data connectivity in over 200 countries. Consumers can purchase the slimduet® thin SIM directly from travel-related channels such as airlines, travel agencies, foreign currency counters at airports or E-commerce platforms, and then download the exclusive APP to shop for international roaming plans in the slimduet Platform. In response to the limitations for mobile virtual network operators (MVNOs) to provide international roaming, Taisys has cooperated with Japan's largest travel agency, H.I.S., and Malaysian and Middle Eastern MVNOs to fully play the role of the distribution center for transnational and cross-border operators and successfully build the world's first eSIM ecosystem. The integrated value-added service provided by Taisys smart thin SIM not only provides one-card multi-number services and high quality and affordable global telecommunications services, but also fulfills the financial services of mobile banking through mobile phones. Even 2G mobile phone users in Africa and India can immediately benefit from the advantages as low-end mobile phones can be used to conduct mobile payment and wire transfer. The SIMoME® Vault independent secure element developed by the company has passed the China Financial Authentication for financial mobile technology service certification of the People's Bank of China this March. The cryptographic algorithm of SIMoME Vault has also been verified by the National Institute of Standards and Technology (NIST), and will soon be FIPS 140-2 Level 3 certified. The smart thin SIM, which can enable users to perform authentication and authorization on their mobile banking app for large amounts of wire transfer and other transactions, is most suitable for online banking. In addition, it can also be used for various application services such as Mobile ID, Fintech, medical and insurance. In August of this year, six Japanese companies (5 banks and 1 telecom operator) jointly launched an experimental project to develop the specifications for the digital certification and signature platform over Taisys SIMoME SIM, which was adopted as a supporting project for Japan Financial Services Agency, "Fintech Demonstration Experiment Center". Ho says that most of the solutions provided by Taisys involve the integration of the most sensitive telecommunications and financial industry in the country. When working with government agencies, security is the top priority. "Our technology can withstand the strictest certification of countries at the national level; this undoubtedly indicates the high appreciation of the stability and security of our technology." With the emergence of new technologies such as Industry 4.0, Financial Technology, and Artificial Intelligence (AI), tomorrow's world will widely embrace the lifestyle of an unmanned economy. However, the new technology is a double-edged sword. While we develop intelligence, we should also take care of personal privacy. Ho believes that, in order to prevent ill-intentioned third-party companies from obtaining huge amounts of big data and to protect peoples’ privacy from running unprotected through the Internet, there are two important links in driving the unmanned economy. One is the popularization of 5G as promoted by the telecom operators, and the other is the establishment of a Mobile ID led by the government. In recent years, the Japanese government has vigorously promoted the new personal number system called "My Number", bidding farewell to the era of the absence of identity cards, giving each civilian a 12-digit lifetime personal number that can be linked to banking and medical records, social insurance, tax filing system or mobile payment certification service. It is expected that the data will be integrated into mobile phone carriers by 2019 to allow people to perform various identity authentication actions with ease through their mobile phones. Ho strongly supports this policy of the Japanese government, "Promoting Mobile ID is the ultimate means to truly implement online security of privacy." Taisys will work with the Japanese government with its exclusive Mobile ID technology to store certification on the Taisys smart thin SIM and protect personal information from leaking and at the same time, achieve anonymity that meets EU's GDPR regulatory requirements through the FIPS-certified hardware secure element. It is an infrastructure solution that not only meets security regulations but also controls privacy through technology. “Furthermore, our technology can fill in the missing piece of the eSIM puzzle which is eKYC that is now unattainable by device manufacturers. The eSIM concept is all about user experience. With Mobile ID inside the thin SIM, user authentication can be done online, eliminating the need for user to physically present identification cards at MNO counters, complying to local government imposed KYC regulations electronically,” adds Ho. With the world’s exclusive smart thin SIM technology, Taisys continues to create more convenient, safe and smart solutions. A thin film chip is rewriting the future of our technology-driven lives. Founded in 1987, Business Weekly is the most influential Chinese business magazine, with an average weekly paid circulation of 147,339 audited by the ABC (Audit Bureau of Circulation) during January to June 2009. It is the largest authenticated circulation in Taiwan.